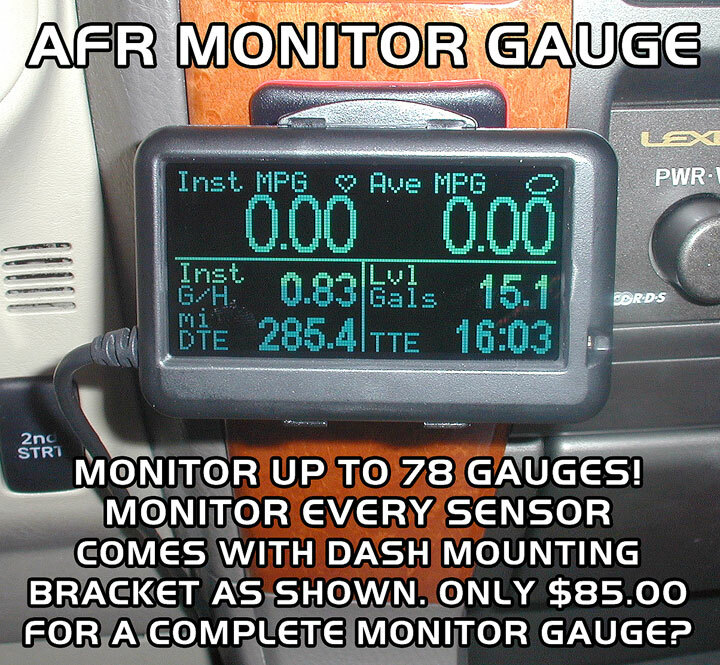 AFR MONITOR GAUGE Will work on 98% of all cars, SUV's and pickup trucks. (1996 to 2016) You hook it up to your under the dash OBD II port. Comes with dash mount bracket. Monitor everything that is going on with your engine. Up to 78 different gauges to monitor, with a full adjustable menu. MPG, RPM, Calibration features. • Fuel Economy - Instantaneous MPG, Average MPG, Distance to Empty, Time to Empty, Fuel Used, Fuel rate, etc. • Performance - Provides acceleration and braking times, such as 0-60, 0-100, Quarter Mile, etc. • Alarms - create alarms for any gauge to warn of such events as coolant temperature too high.